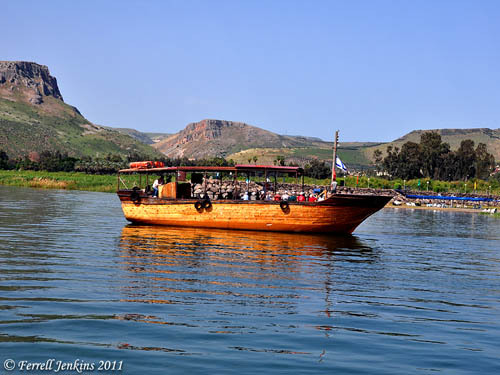 The Sea of Galilee is called the “lake of Gennesaret” (Luke 5:1), and the “Sea of Tiberias” (John 6:1; 21:1). This indicates that both Tiberias, where Herod Antipas had built his capital in the mid-20s of the first century, and Gennesaret were significant places. When one traveled from Nazareth, Cana, or others places west of the Sea of Galilee, he would pass by Mount Arbel into the plain or land of Gennesaret. This photo, taken on an unusually clear day, shows a small ship about to anchor at Nof Ginosaur (= Gennesaret). To the west we see Mount Arbel and the pass below allowing travel and commerce between lower Galilee and the towns around the Sea of Galilee. Boat approaching the land of Gennesaret. Photo by Ferrell Jenkins. The photo nicely illustrates the text of Mark 6. The first disciples of Jesus were called by the lake of Gennesaret (Luke 5:1).